Most people from my hometown of Lubbock, Texas use the wrong name for the American Wind Power Center. We call it the “Windmill Museum” and take it for granted as an outgrowth of Mackenzie Park, home of the amusement park Joyland and the Prairie Dog Town. But the 28-acre public space is so much more than that: It’s a repository of ancient stone and a pageant for windmill vanes, with a dedication to exquisite miniature houses that I have never witnessed anywhere else. The oldest object present, a grain-grinding stone that pre-Revolution Americans used to feed their livestock, sits at the facility’s center. A 1,500-pound behemoth that was quarried from sandstone in the British Isles, it ended up a little east of downtown Lubbock through the determination of Billie Wolfe. 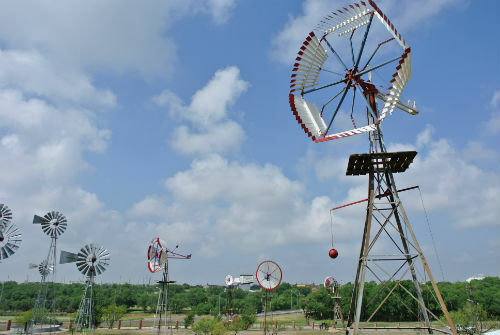 Wolfe was a home economics professor at Texas Tech University in the 1960s who realized that the iconic windmills that she liked to show in class were disappearing. Wolfe decided to travel around the country to fundraise, collect windmills and encourage landowners to preserve them. Coy Harris of the Wind Energy Corporation eventually joined her in her quest. However, Wolfe was not able to see any windmills at the site. “She ended up passing away before the new building went up,” says Tamara Hall, the center’s director. Perseverance and meticulous attention to detail are themes throughout the museum. At the entryway, a visitor does not greet turbines — they face about a dozen miniature houses, each lovingly created and donated by local artist Alta Reeds, who has constructed miniatures for the past 35 years, according to the Lubbock Avalanche-Journal. There is a witch house, complete with brooms and pumpkins, but many convey the most ordinary possible domestic scenes, complete with set tables and made beds. The miniature houses are just a warm-up. 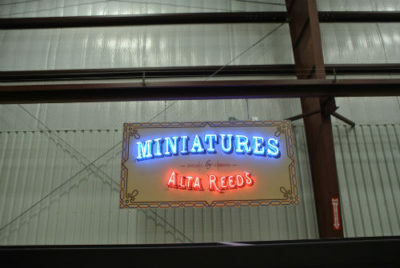 Beyond lies a 4,000 square foot miniature train set, complete with details of early 20th century Lubbock. 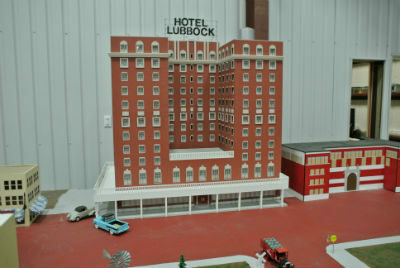 “This is Post, Texas, Abernathy, it goes into Plainview and then down to Lubbock County,” says Hall, describing the towns that surround Lubbock, in real life and in miniature. It’s only after the trains, finally, that we get to the windmills. Windmills without blades. Windmills shot through with bullet holes and windmills that have the word “Dandy” across the vane. In addition to the main attraction, there are special windmill accessories of which I have lived my entire life in ignorance. 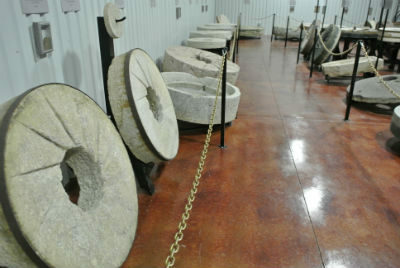 The American Wind Power Center boasts the most complete collection of windmill weights in the world, which father and son team Elmer and Melvyn Miller began collecting in 1980. Windmill weights are cast-iron animal shapes that counterbalance the blades in windmills with no vanes. The Millers traveled around their home in Wheaton, Minnesota, to other parts of their state and to both Dakotas, collecting the weights. The most popular shape is a rooster. 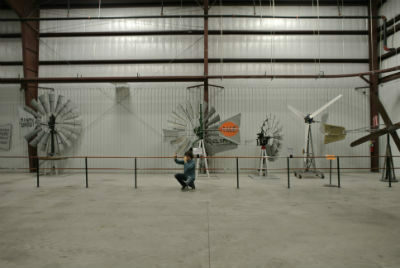 After Elmer died in 1996, Melvyn donated his collection to the American Wind Power Center. Before visitors exit the building to once again face the west Texas sky, they get one last treat. In 2009, Texas Tech architecture professor La Gina Fairbetter unveiled a nearly 6,000 square foot mural called “The Legacy of the Wind,” which took four years to complete. The mural features a farm town surrounded by different windmills throughout history. At the center of the room, two men are perched on top of the largest windmill. One is handing the other a screwdriver, but they look cheerful — uplifted, literally. Maybe this is the best of all possible worlds.